The quilts for today's trunk show come from left overs from previous quilts. In a previous post I showed you a Mystery Quilt. During the construction of that quilt, I ended up with a considerable number of half square triangles. I had lost track of those HSTs until I came across them while looking for something to take to a retreat. I chose to take those with me and just play. What resulted was this happy little quilt that was donated to the neo-natal ward at the local hospital. Ah, success, I finally got to write a comment. 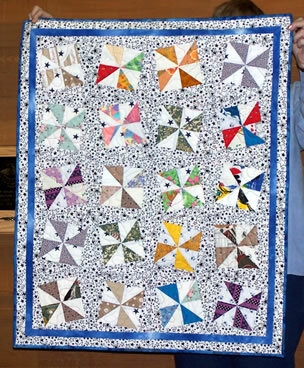 Love this skewed quilt and is a perfect addition for a children's ward! A happy, cheerful addition to any nursery. Cheer is definitely needed in the neo-natal ward. My 2 granddaughters both had their starts there for several months until they were big enough to go home. No a fun time.